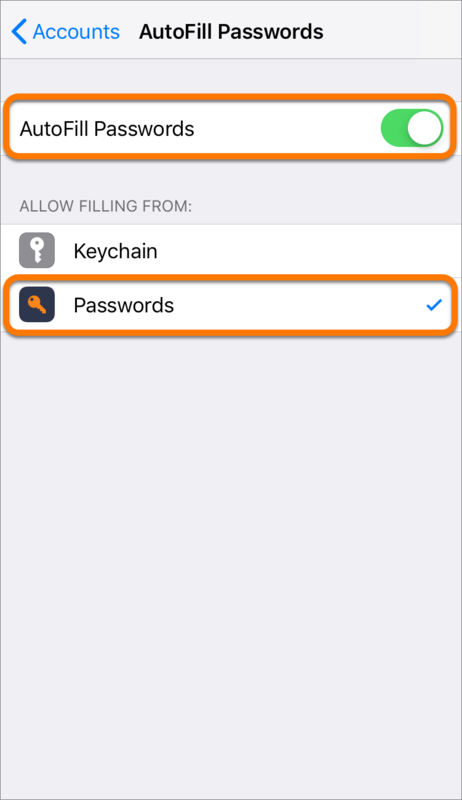 Tap the Avast Passwords icon to open the app, then read the intro or start configuration immediately by tapping Skip in the bottom-left corner. Tap Get Started to begin configuration. 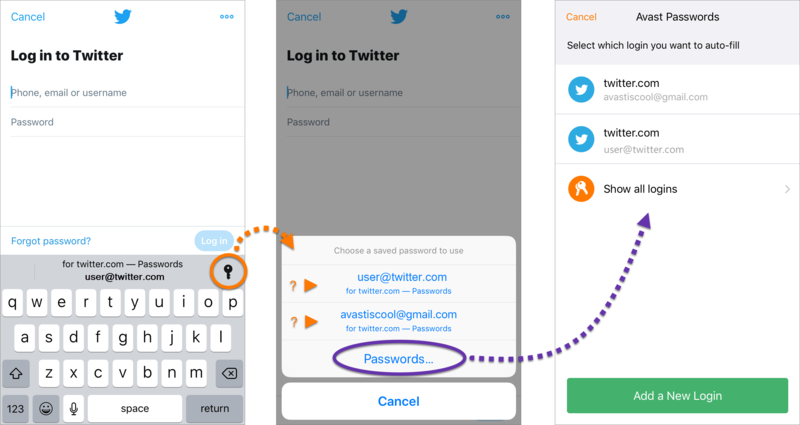 Create a Master Password and tap Create Password. Your Master Password can be either a plain text password or a 4-digit password. On the next screen enter your Master Password again and tap Confirm. 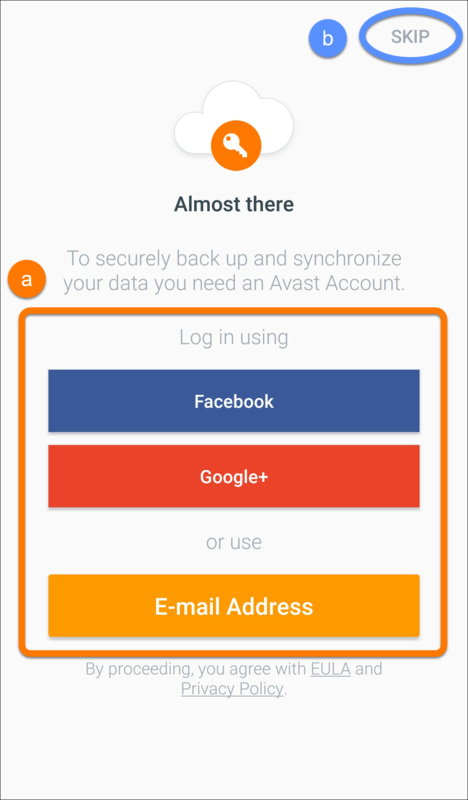 Log into your Avast Account to set up synchronization and backup your data. 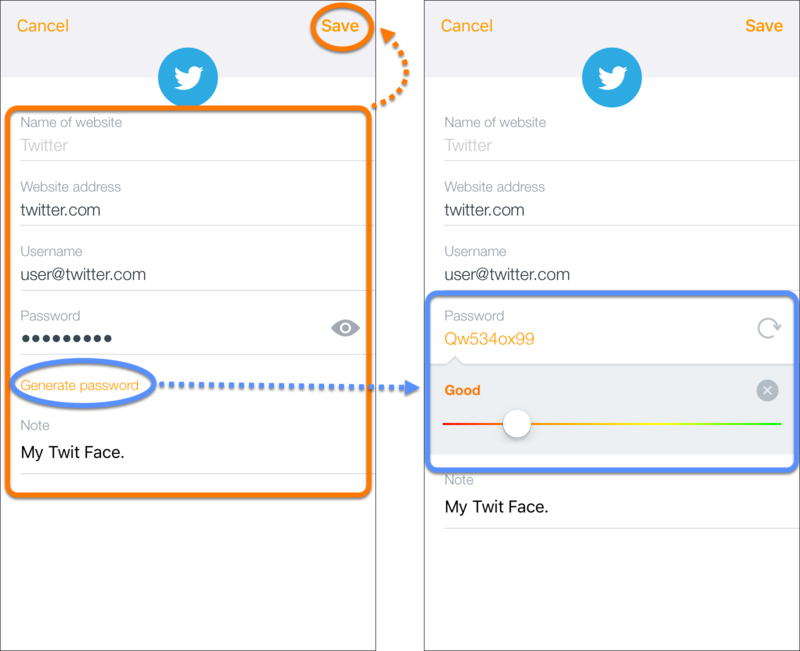 Tap Skip if you don't want to synchronize passwords across your devices. If this is the first device you are synchronizing, an Avast Passwords synchronization group is created and a backup is sent to your email address. The password for this backup is the same as the Master Password for the device (the first device added to the group). 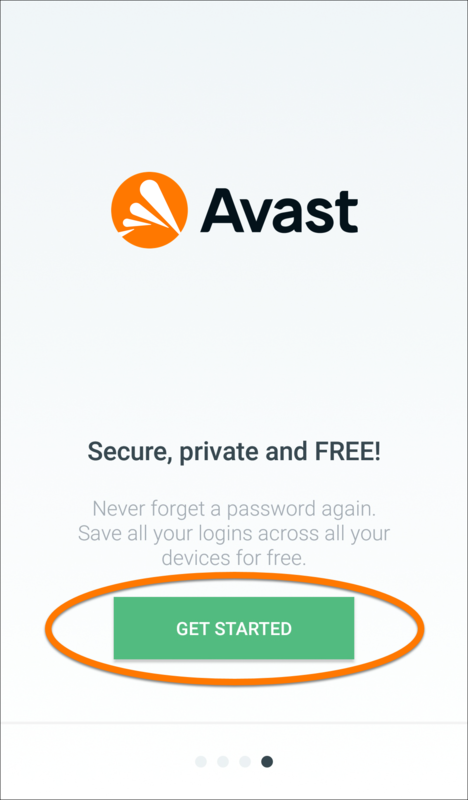 If you are adding this device to an existing synchronization group for Avast Passwords, you must authorize it on a device which is already authorized. Confirm the authorization message which appears on your previously authorized Windows PC, Mac, Android or iOS device. Tap Setup Now, then tap Setup autofill. Tap Enable accessibility, then tap Go to settings. 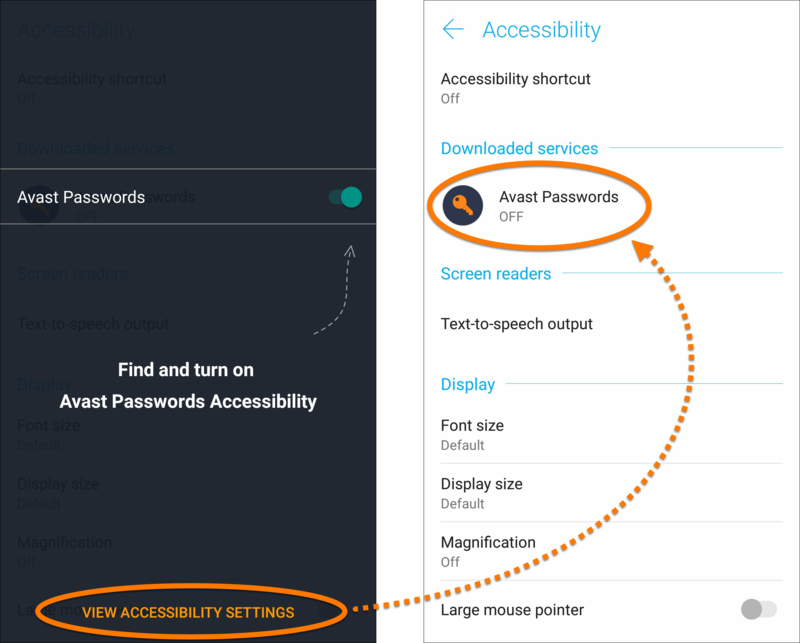 Tap View Accessibility Settings, then tap Avast Passwords. Tap the slider to enable the permission, then tap OK to confirm. 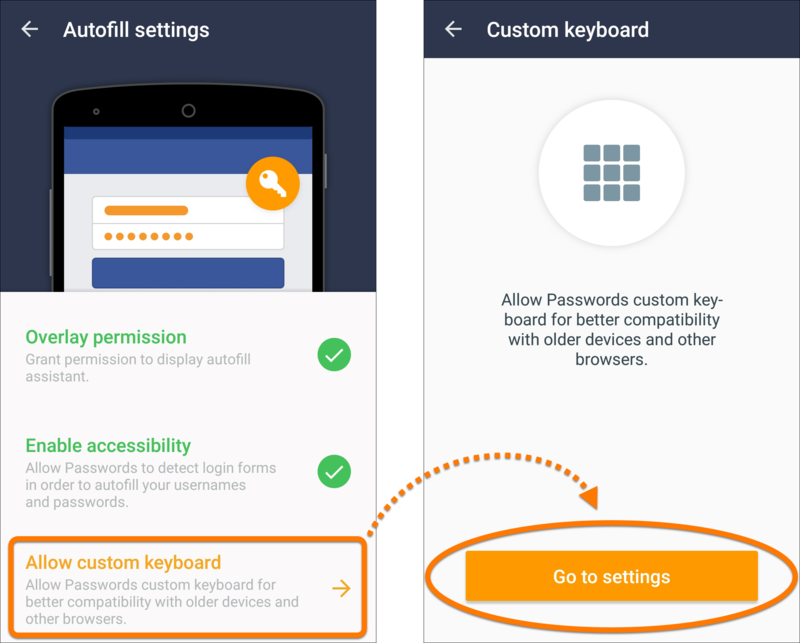 Tap the back arrow to return to Avast Passwords and tap Allow custom keyboard. On the next screen, tap Go to settings. Tap Finish to complete the configuration process. Tap Get started to start configuration. Create a Master Password and tap Set. Enter your Master Password again on the next screen and tap Confirm. Tap Allow if you want to receive notifications. Confirm this setting by tapping Allow in the dialog box. 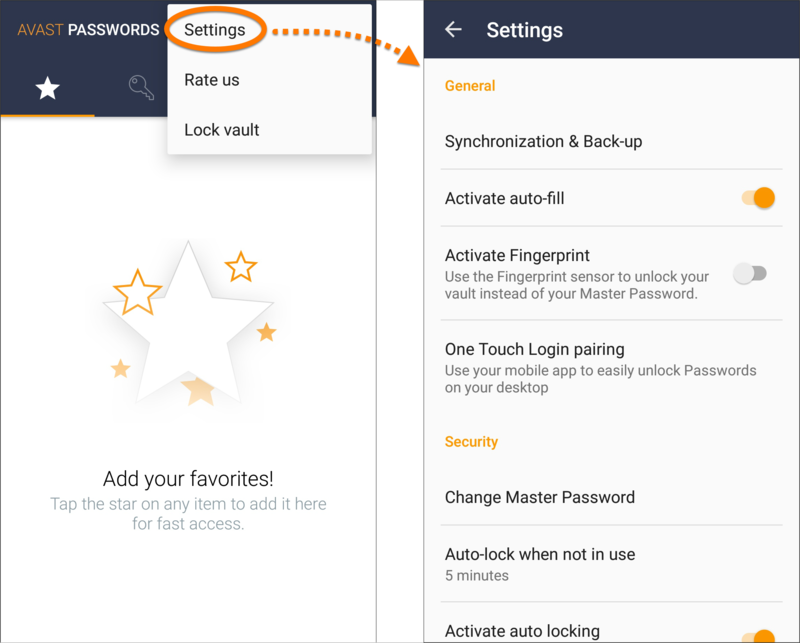 Tap the Settings icon at the bottom of the main Avast Passwords screen. Select Autofill and tap Activate in Safari. 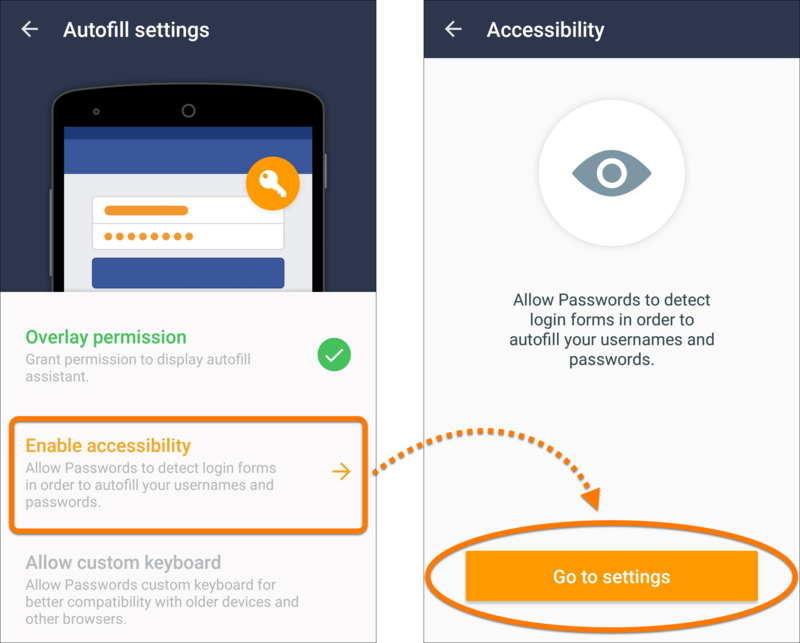 Close the app and open your device settings to set up autofilling using Avast Passwords. Tap the slider next to AutoFill Passwords so that it changes from white to green, then tap Passwords so that a blue tick appears. 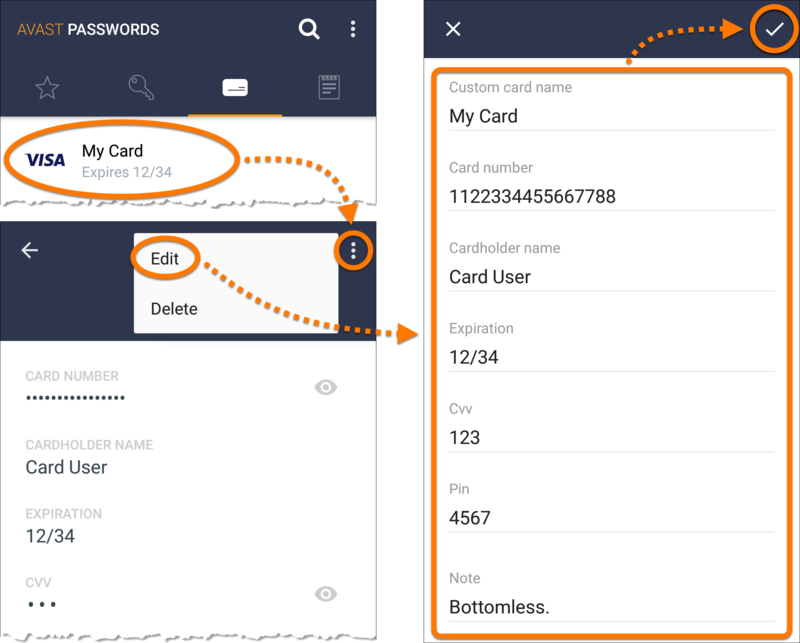 Return to Avast Passwords to manage your accounts, cards, or notes. 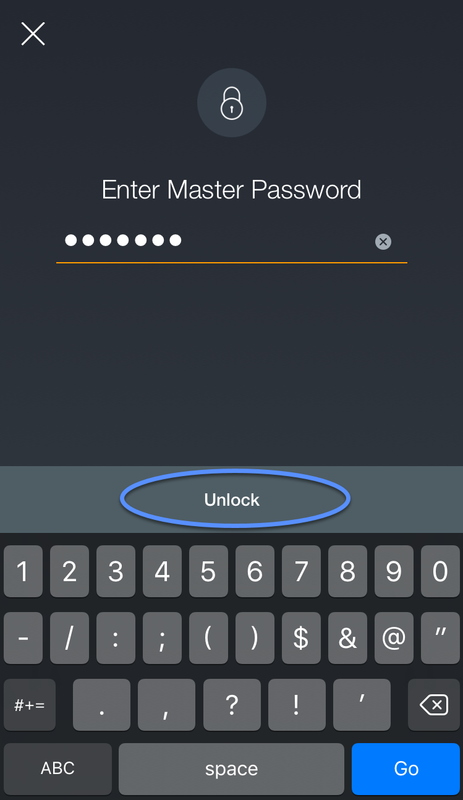 Tap the key icon on the main Avast Passwords screen, then tap the plus icon and select an account from the list. If the account you want to add is missing from the list, tap Add login. Name of website: the name of the website or a name that will allow you to easily find and recognize your account. Website address: the website address of the account, for example, https://www.example.com. 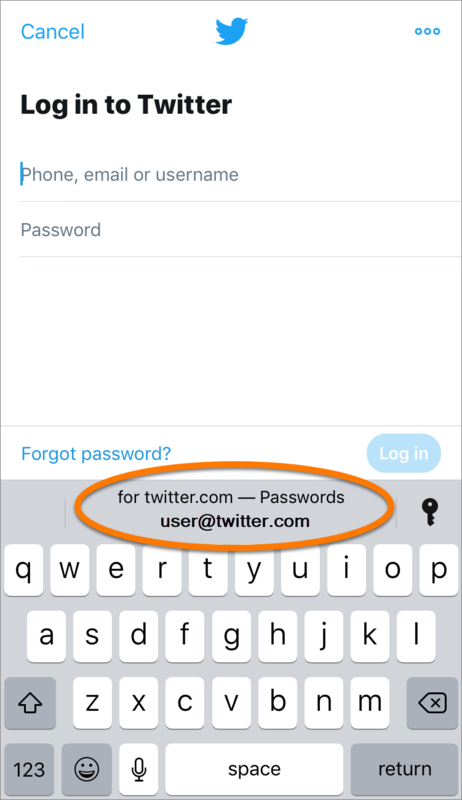 Password: the password that you currently use to log into the account. Alternatively, tap Generate Password and move the slider to adjust the password strength according to your preferences. This is especially useful if you are setting up an account on the selected website for the first time, or re-setting your password. 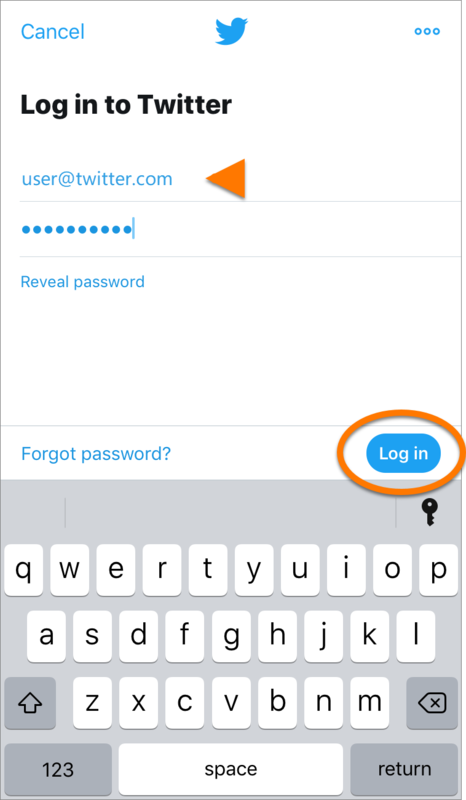 If you selected an account that was already in the list, then you are only asked to provide the Username, Password, and optionally a Note. Tap an account tile to open the account contents. 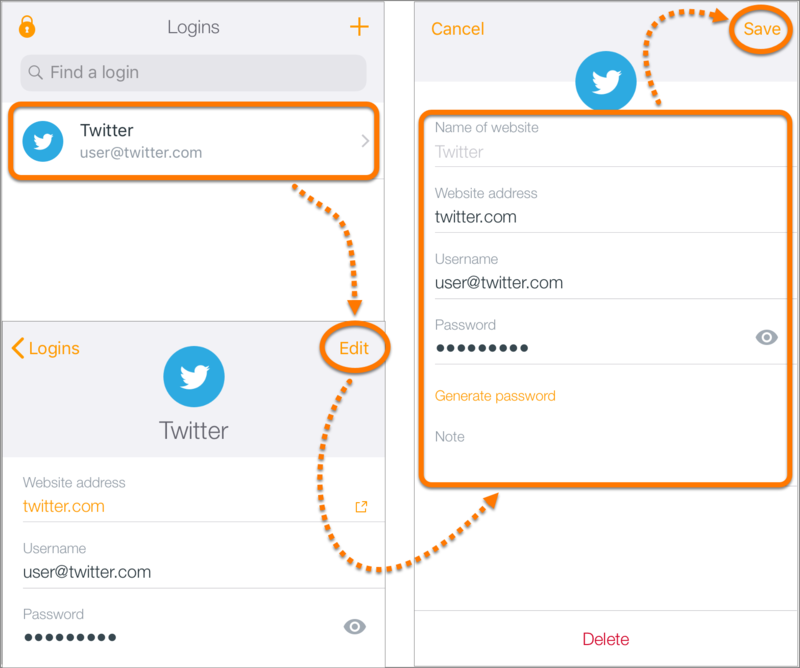 Edit an account: Tap the ⋮ menu icon (three dots) and select Edit to edit the account details. Confirm your changes by tapping the tick icon. 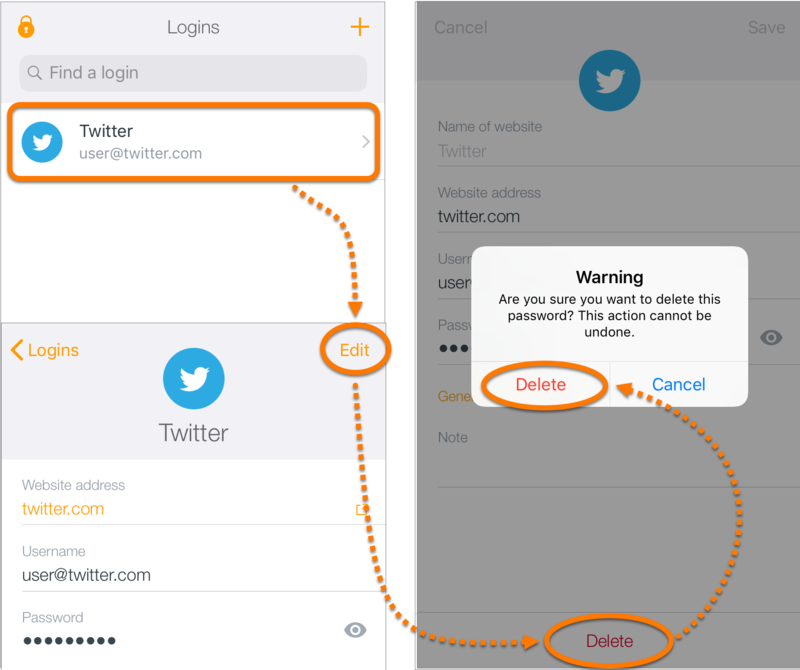 Delete an account: Tap the ⋮ menu icon (three dots) and select Delete to completely remove the account. 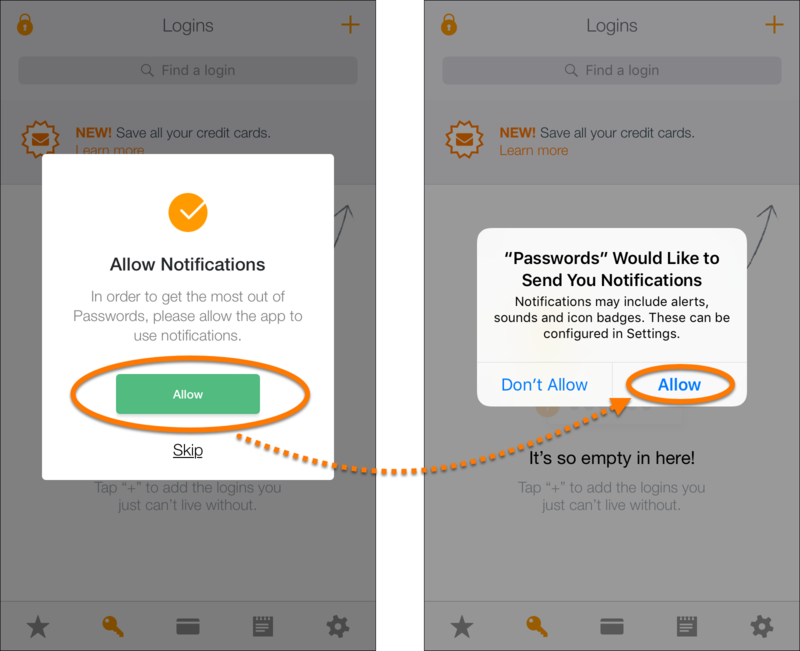 Confirm removal of the account by tapping OK in the dialog box. 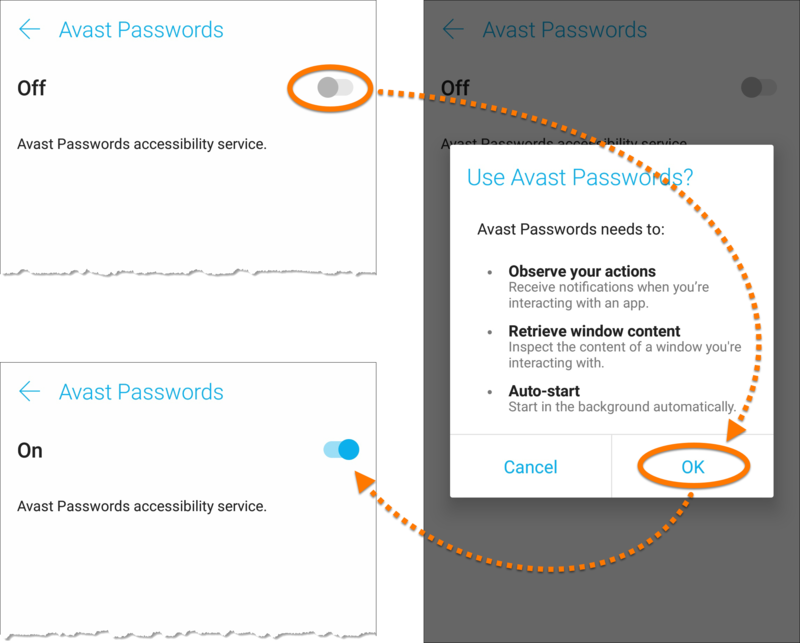 Tap the key icon on the main Avast Passwords screen, then tap the plus icon. Select an account from the list. If the account you want to add is missing from the list, search for it or tap Custom to add it. 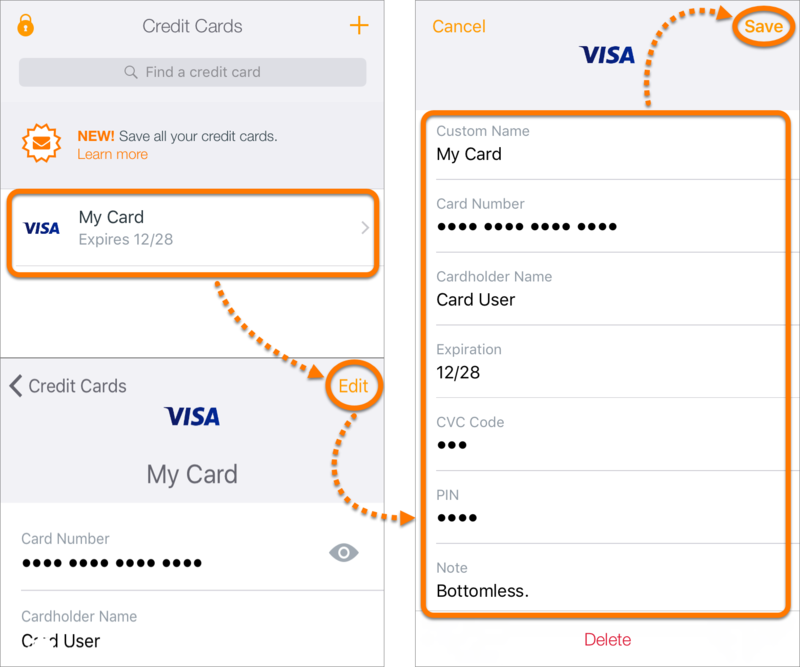 Edit an account: Tap Edit to edit the account details. Confirm your changes by tapping Save. Delete an account: Tap Edit then tap Delete to completely remove the account. Confirm removal by tapping Delete in the dialog box. Accounts cannot be restored after they have been deleted. 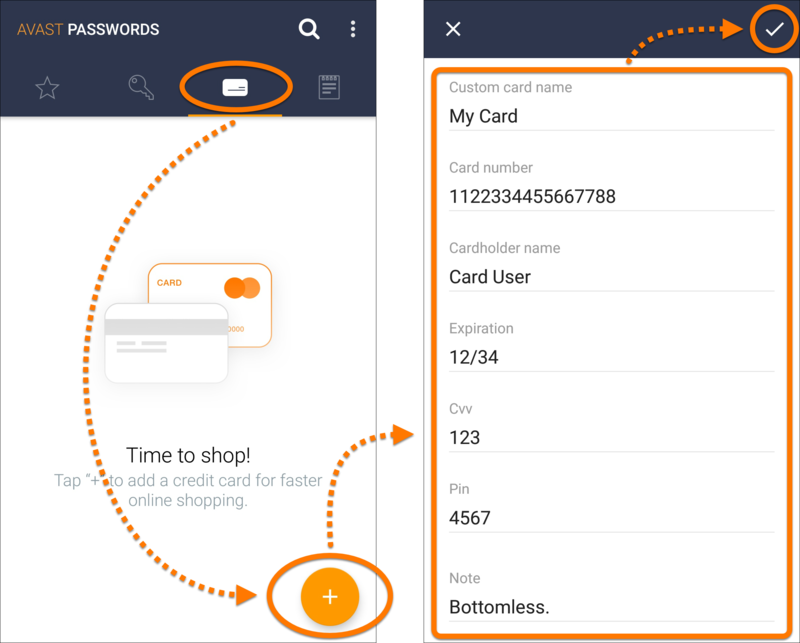 Tap the credit card icon on the main Avast Passwords screen. Tap a card tile to open the card details. 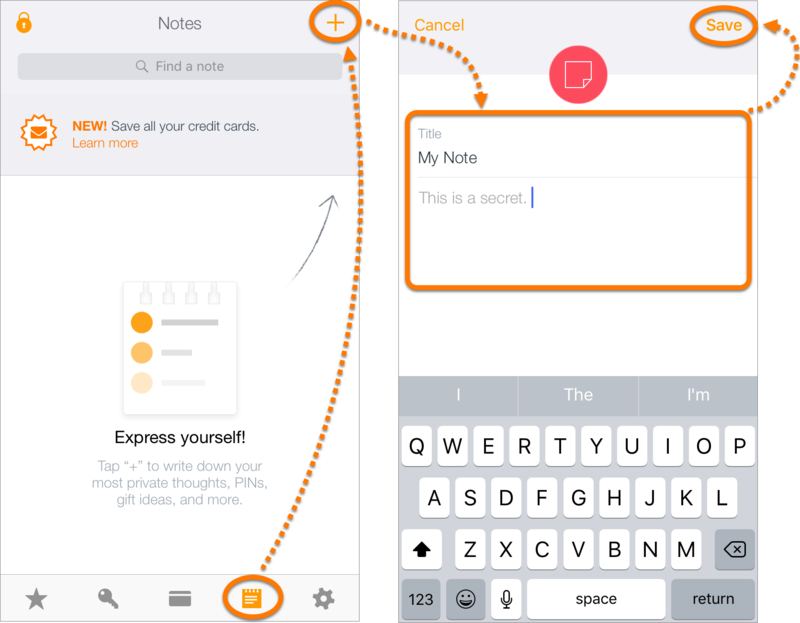 Edit a card: Tap the ⋮ menu icon (three dots) and select Edit to edit the card details. Confirm your changes by tapping the tick icon. Delete a card: Tap the ⋮ menu icon (three dots) and select Delete to completely remove the card. Confirm removal of the card by tapping OK in the dialog box. Custom name: a name that will help you recognize this card. CVC Code: a 3 or 4 digit security number that is visible on the signature panel on the back of the card. PIN: a PIN code protecting the card. Tap Save to confirm the card details. 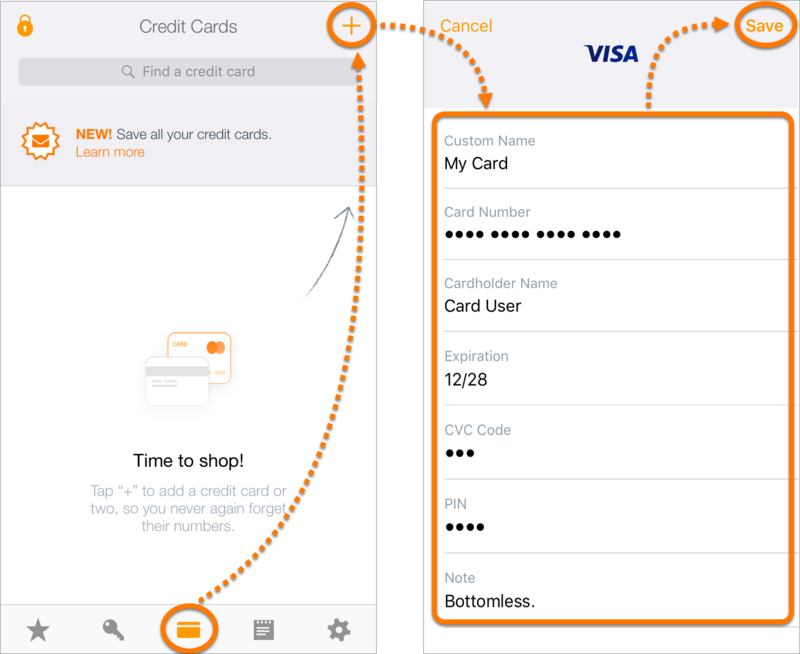 Edit a card: Tap Edit to edit the card details. Confirm your changes by tapping Save. 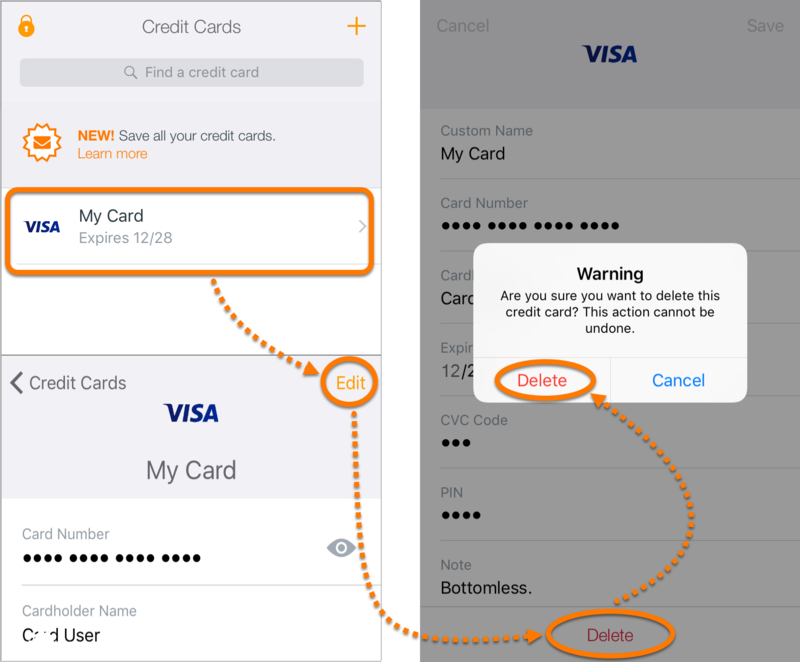 Delete a card: Tap Edit then tap Delete to completely remove the card. Confirm removal by tapping Delete in the dialog box. Cards cannot be restored once you delete them. The Secure Notes section is a place where you can safely store notes in Avast Passwords. All notes are encrypted and protected by your Master Password to ensure maximum security. This feature protects your confidential information from unauthorized access. 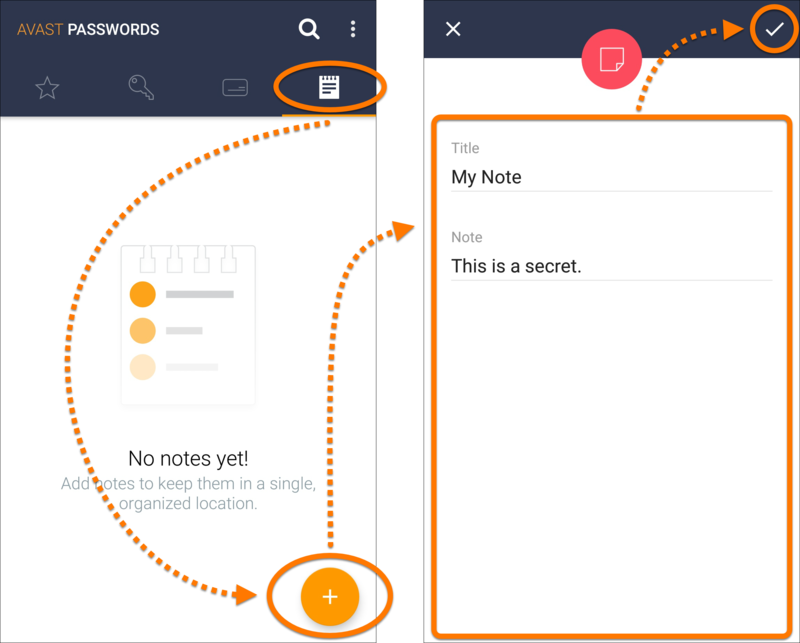 Tap the note icon on the main Avast Passwords screen. Note contents: any data that you want to keep secure, such as PIN codes and contact details. 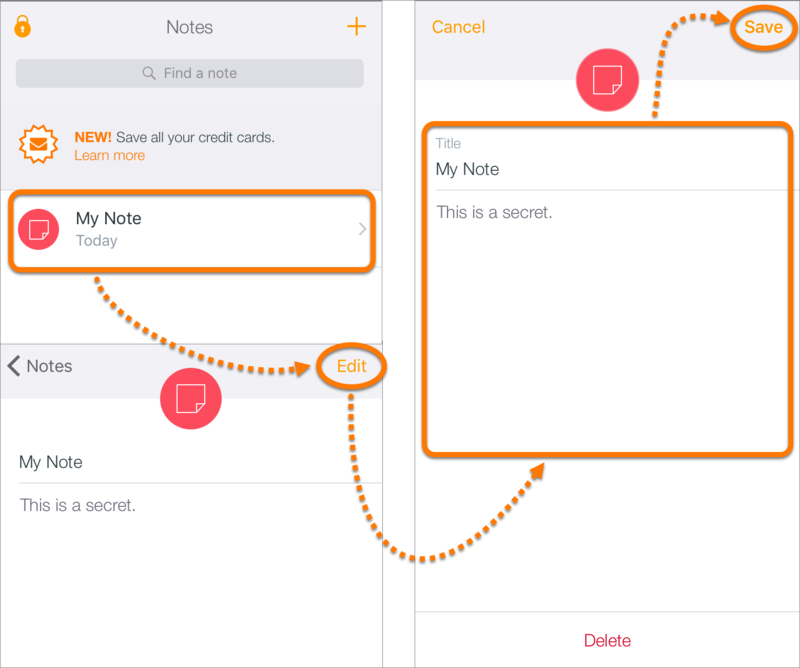 A tile representing your newly added note appears on the Notes screen. Tap a note tile to open the note contents. Edit a note: Tap the ⋮ menu icon (three dots) and select Edit to edit the note contents. Confirm your changes by tapping the tick icon. Delete a note: Tap the ⋮ menu icon (three dots) and select Delete to completely remove the note. Confirm removal of the note by tapping OK in the dialog box. Edit a note: Tap Edit to edit the note contents. Confirm your changes by tapping Save. 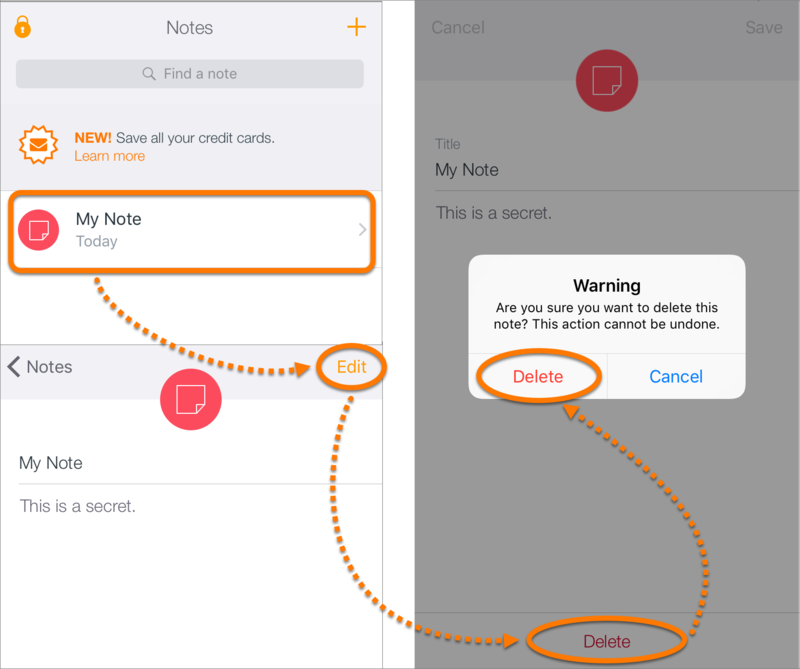 Delete a note: Tap Edit then tap Delete to completely remove the note. Confirm removal by tapping Delete in the dialog box. Notes cannot be restored once you have deleted them. 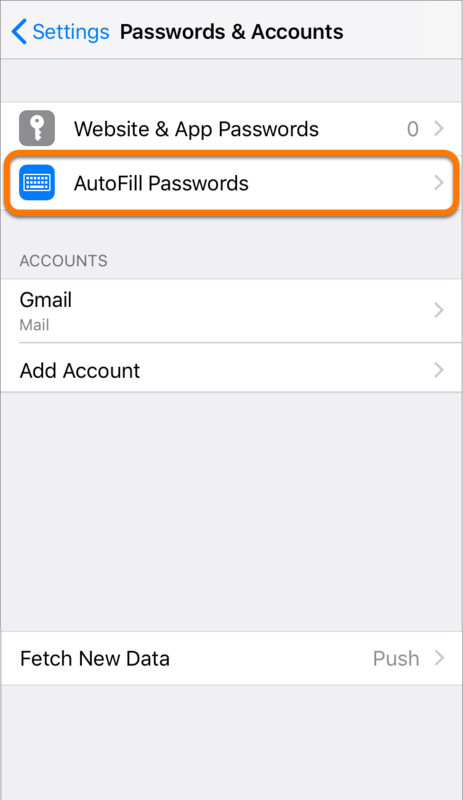 To use the autofill feature, ensure the Accessibility permission is enabled in your device settings. On some devices, it is also necessary to manually enable the custom keyboard. 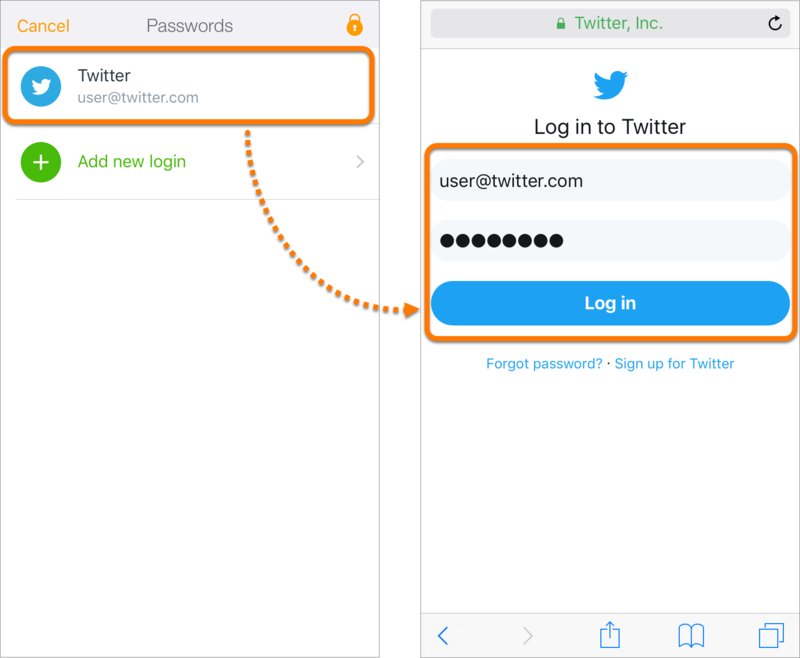 Using either an internet browser or app, open the login page for the account you want to log into. Tap the key icon and enter your Master Password. If you have more than one account for the website, select the account you want to log in with. You can also tap the ⋮ menu icon (three dots) to select other options. To use the autofill feature, ensure autofill is enabled in your Safari settings. Go to Settings ▸ Autofill, tap Activate in Safari and follow the tutorial to complete the process. 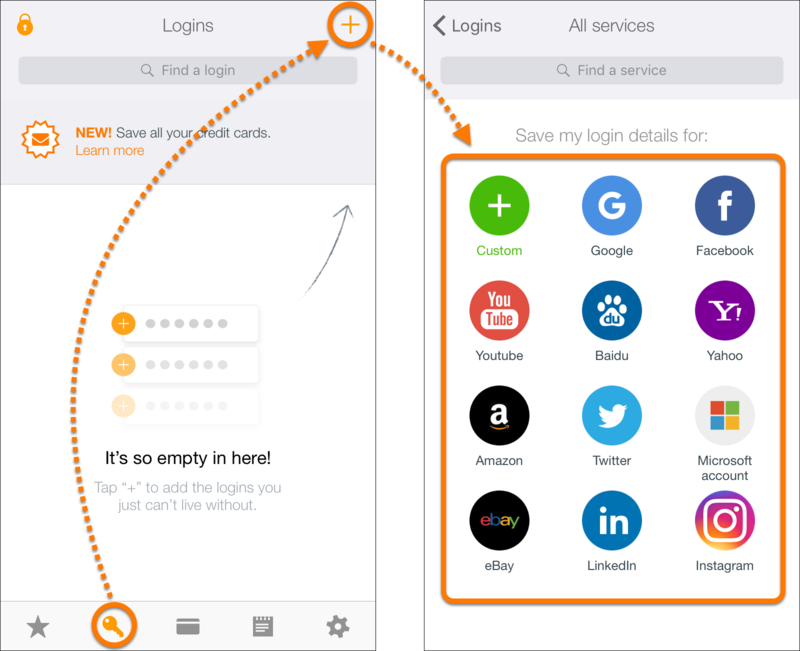 Using either an internet browser or app, open the login page for the account you want to log into. 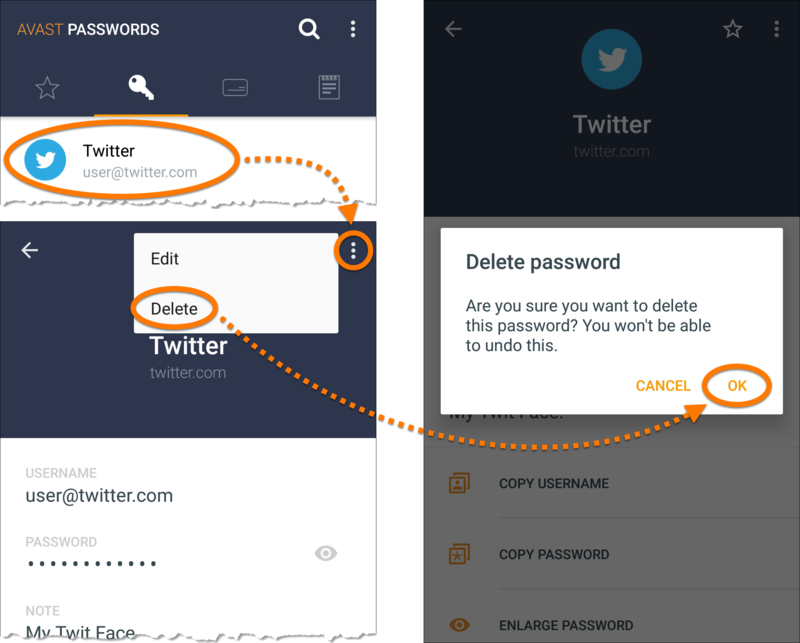 Tap the share icon and select Avast Passwords. 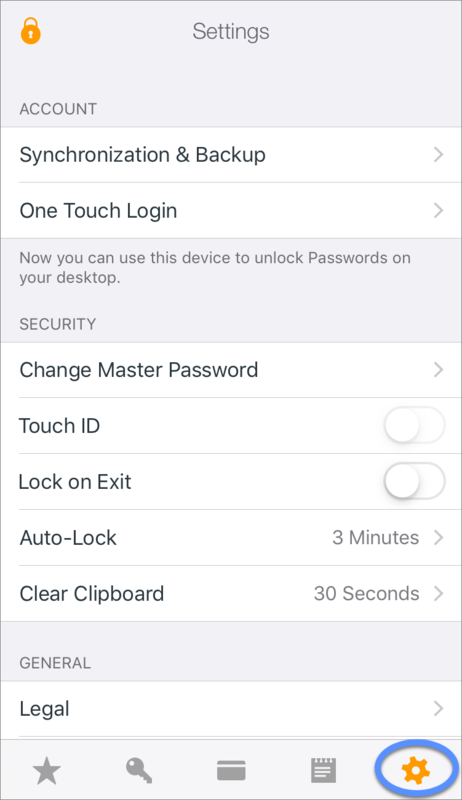 Use your Touch ID or enter your Master Password, and tap Unlock to authorize access. Tap the account. 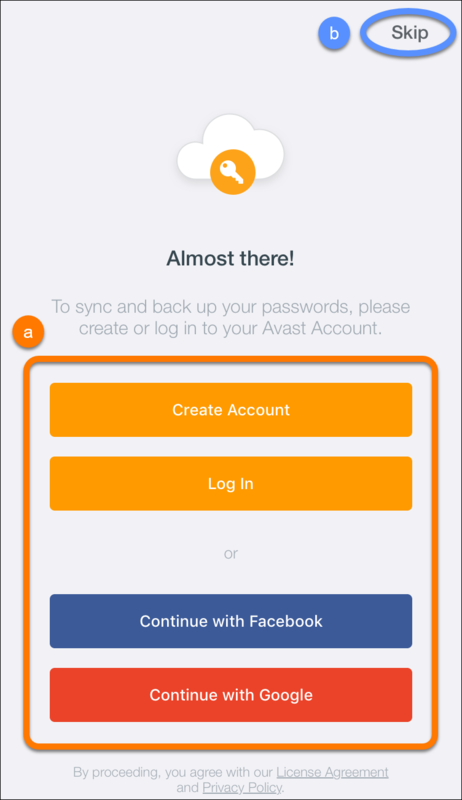 Your log in details are automatically entered by Avast Passwords. Tap Log in to finish the process. 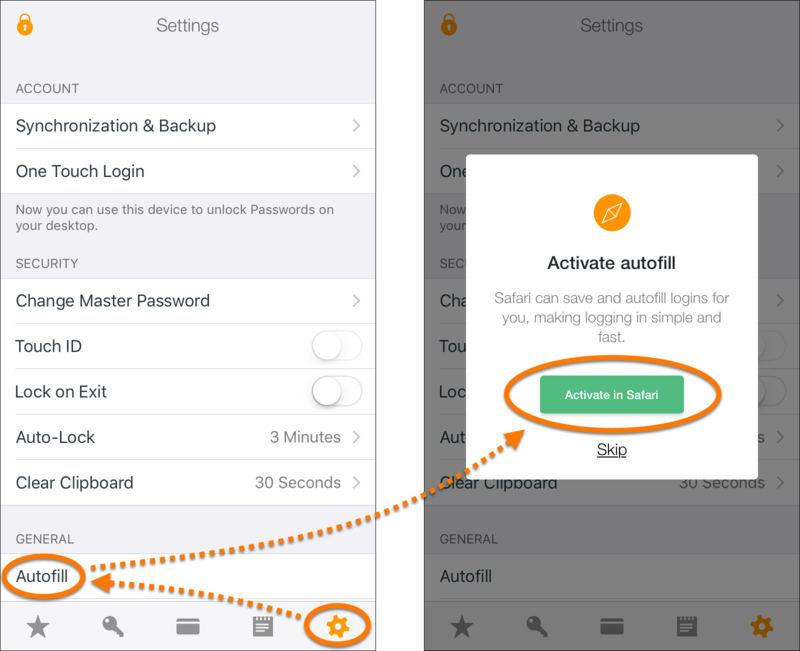 To use the autofill feature, ensure autofill is enabled in your device settings. 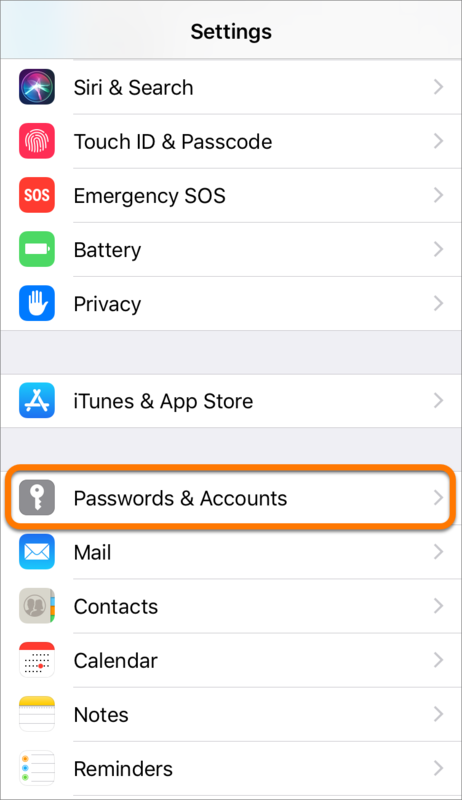 Go to Settings ▸ Passwords & Accounts ▸ AutoFill Passwords, tap the slider next to AutoFill Passwords so that it changes from white to green, then tap Passwords so that a blue tick appears. 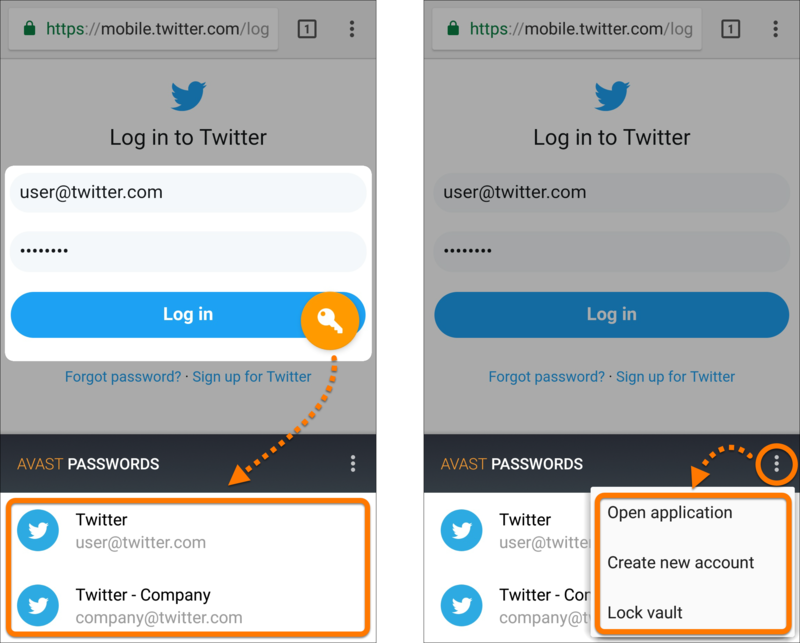 Using either an internet browser or app, open the login page for the account you want to log into. Tap your account details to autofill your username and password. Alternatively, if you have more than one account for the website, tap the key icon and select the account you want to log in with. 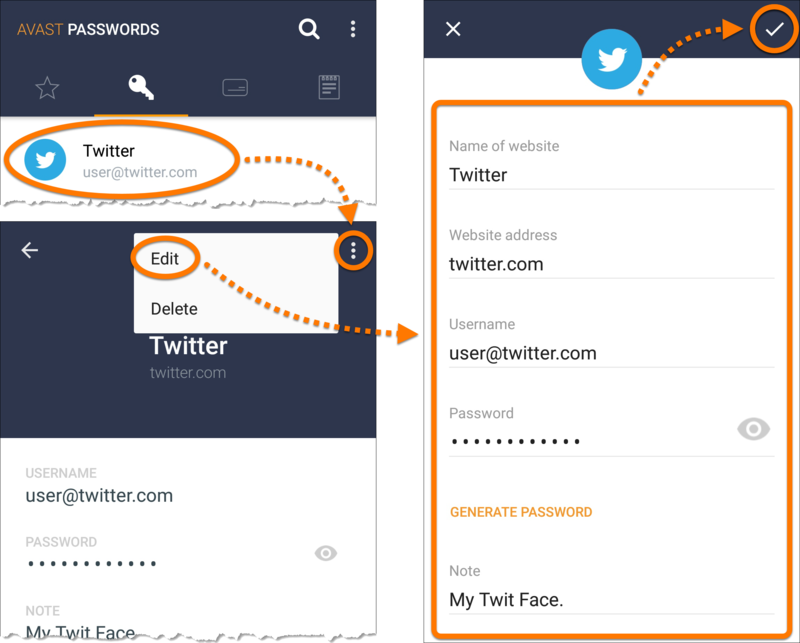 You can also tap Passwords to go to the app and select an account to use or view all logins saved in Avast Passwords. 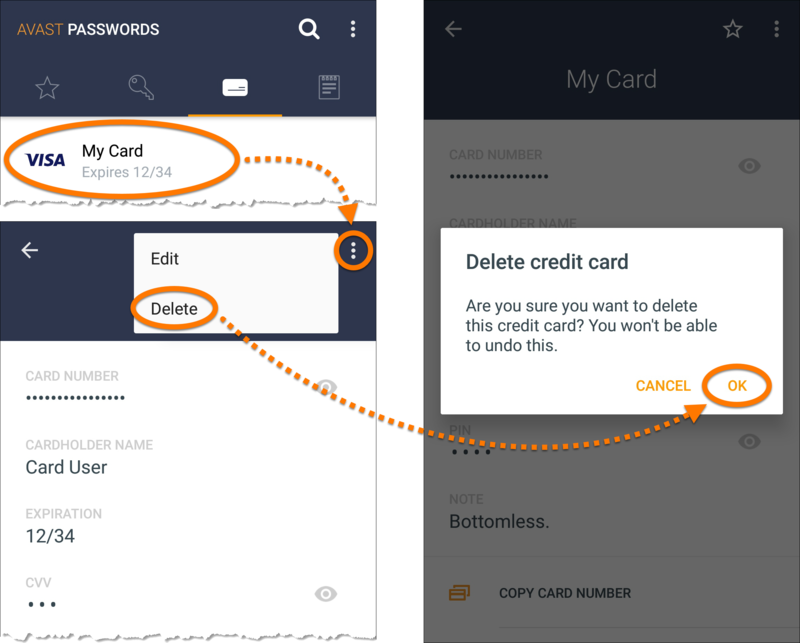 Your account details are automatically entered by Avast Passwords. Tap Log in to finish the process. Tap the ⋮ menu icon (three dots) in the top-right corner and select Settings. 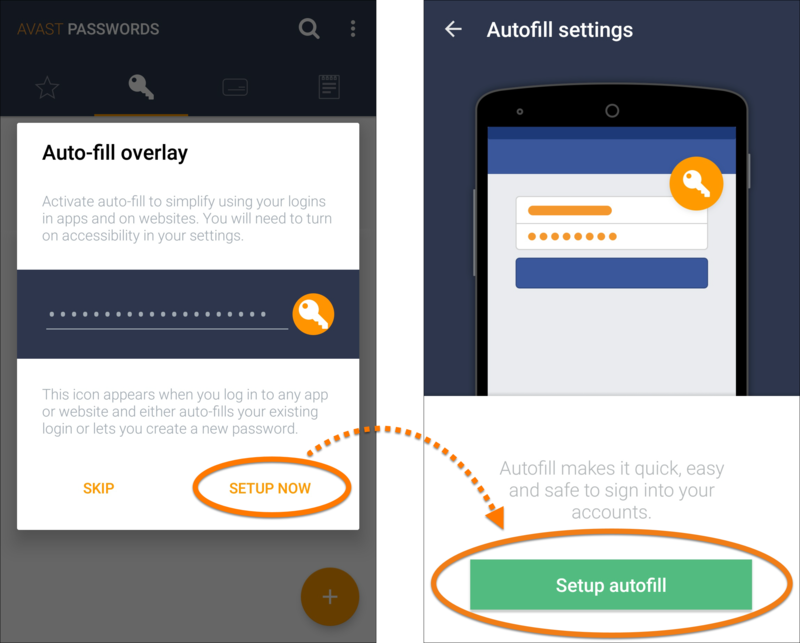 Activate auto-fill: enable Avast Passwords to fill out your login details automatically. Activate Fingerprint: use Fingerprint instead of Master Password when you log in. Change Master Password: change your current Master Password. 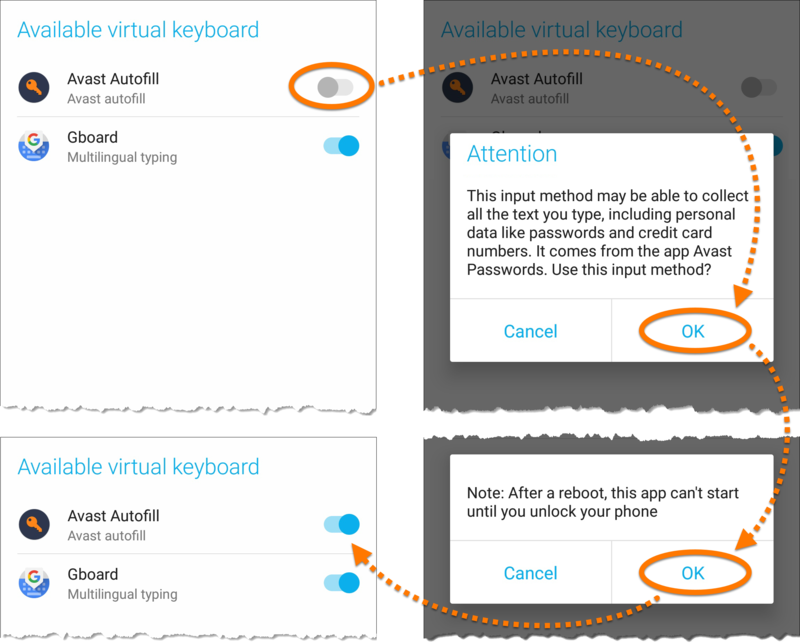 Auto-lock when not in use: specify the time period after which Avast Passwords is automatically locked (by default 5 minutes). Activate auto locking: lock Avast Passwords 5 seconds after the screen turns off. Enable screenshots: enable taking screenshots to send to Avast Support in case of any issues with the app. 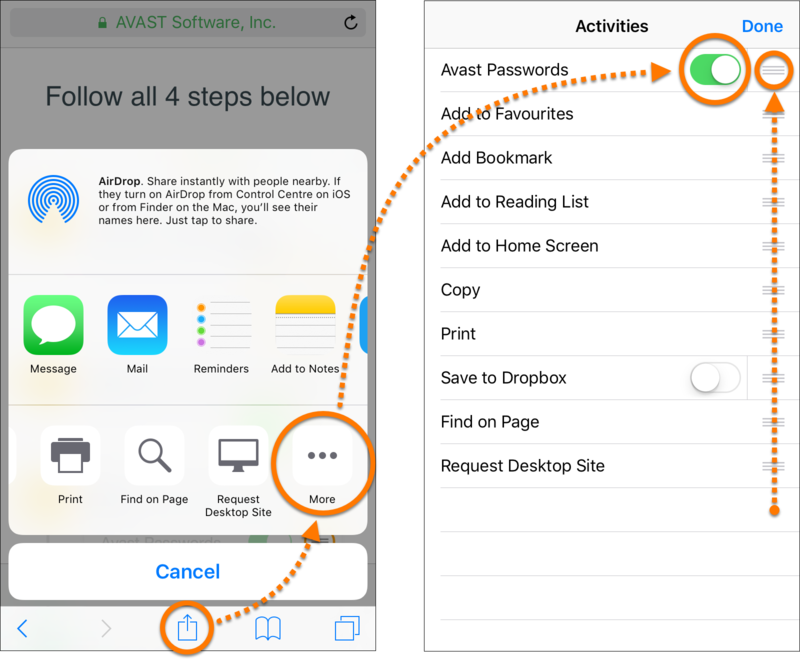 Enable shortcuts: access your account details records quickly by creating a shortcut from the apps screen on your device. 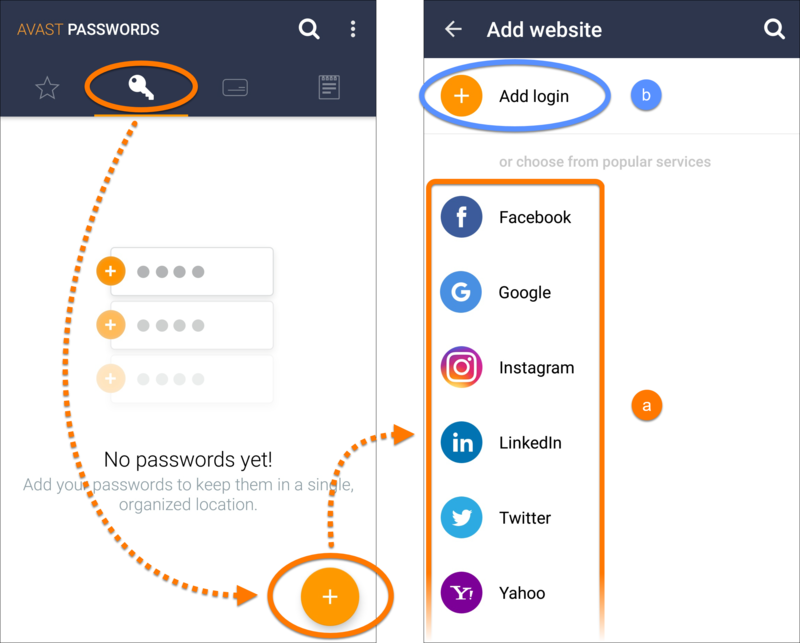 When this feature is enabled, tap and hold the Avast Passwords icon on the apps screen of your device to view the last 4 account logins used on your device. Tap an account login to create a shortcut on your home screen to quickly access and edit your account details. 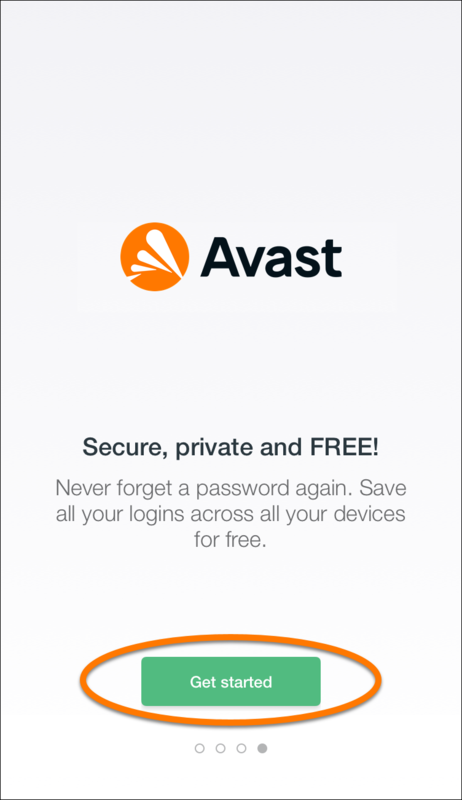 Tap the Settings icon on the main Avast Passwords screen. 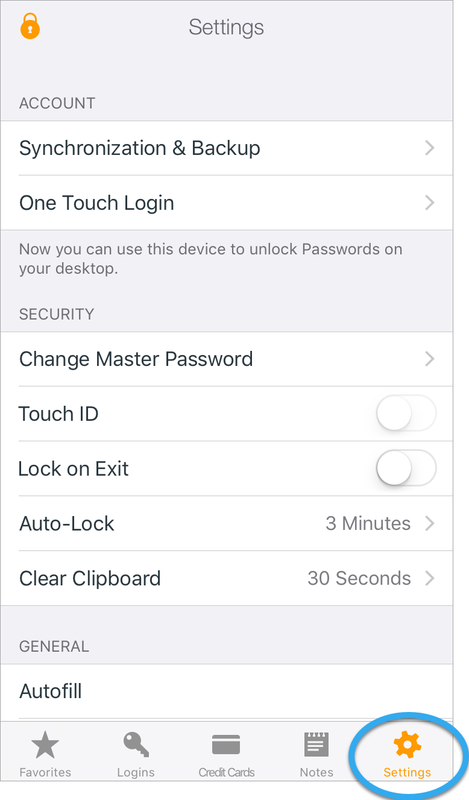 Touch ID: use Touch ID instead of Master Password when you log in. 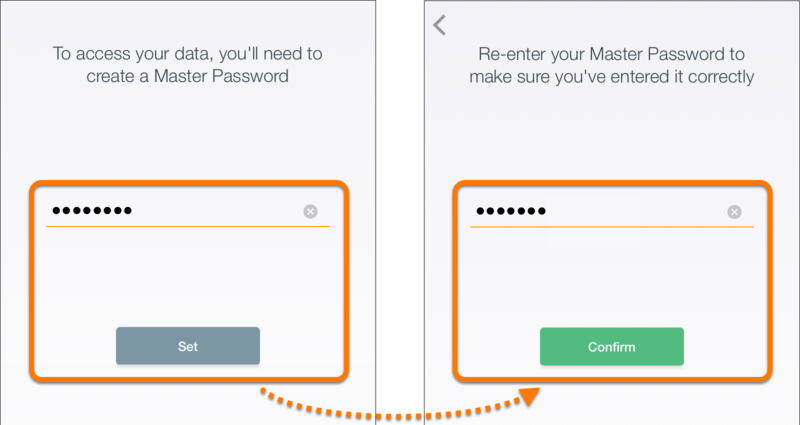 Lock on Exit: lock Avast Passwords after you exit the app. 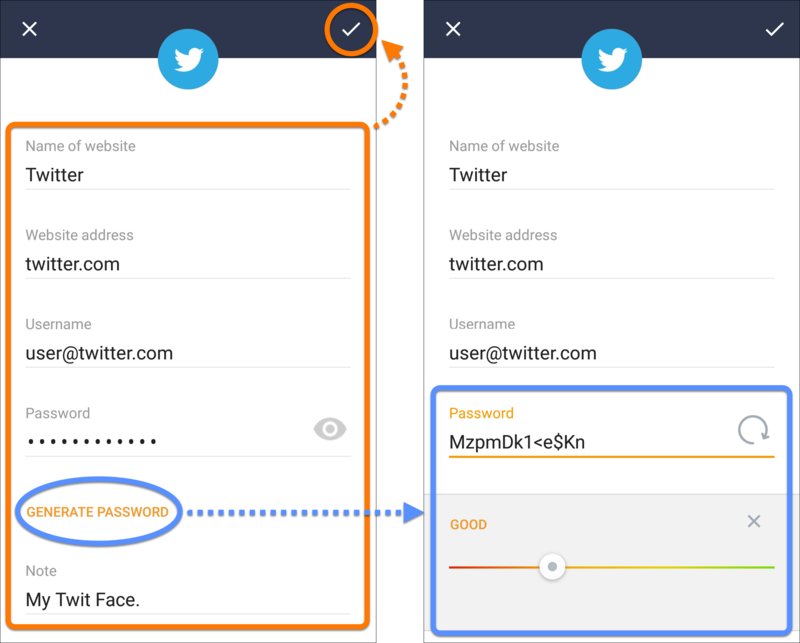 Auto-Lock: specify the time period after which Avast Passwords is automatically locked (by default 3 minutes). 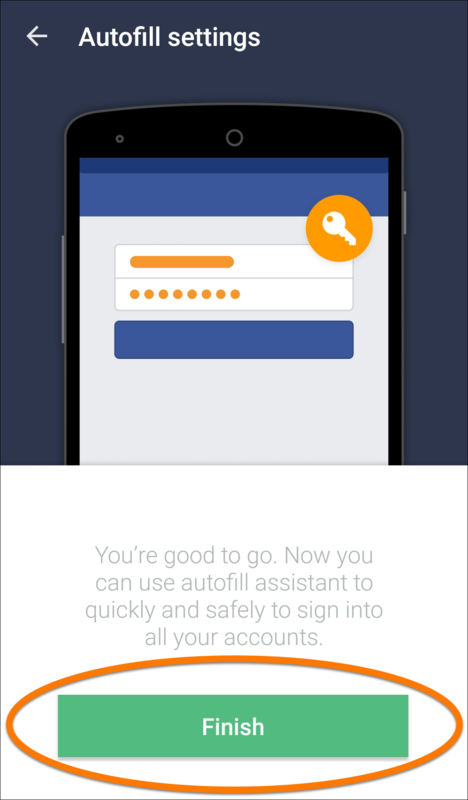 Autofill: enable Avast Passwords to fill out your login details automatically.